I may flash some spoilers. 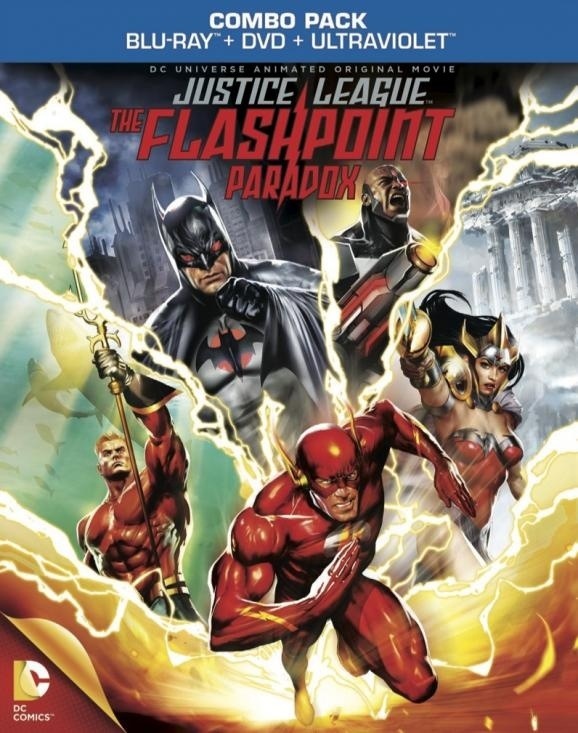 The latest animated DC Universe film finds Barry Allen, The Flash, in a fight for the past, present, and future in this epic tale of love, loss, and war. What happens when the fastest man alive stops moving forward and instead looks back on what might have been? This is the question that is asked and answered as the Flash changes history for noble yet selfish reasons and jeopardizes the entire planet in the process. After stopping his arch enemies, The Rogues, from blowing up the city Flash is taunted by Professor Zoom about the one person he couldn’t save. When he was a young boy Barry’s mother was murdered in a mysterious home invasion and he has carried the memory with him all his life along with the guilt of not being fast enough to save her. After Zoom’s taunt Barry runs faster than he ever has before and wakes up in a world much like our own but drastically different. Barry’s mother is still alive but he is powerless, his wife never married him, the Justice League never formed, and Aquaman is fighting Wonder Woman in a full scale war with the fate of the world in the balance. This causes him to seek out the one man he knows can help him, The Batman. Saying anymore would give away huge plot twists. If you read the original comic book there should be no surprises but I will leave things relatively unspoiled for the uninitiated. The animation is top notch and very reminiscent of Japanese animation. Character designs and backdrops all come to life and are very visually interesting and varied. Even though the movie is very dark the colors do stand out when needed to highlight important moments. The voice cast here does brilliant work bringing out the pathos of each character. Justin Chambers and Kevin Mckidd truly shine as The Flash and Batman respectively. These two are the leads of the film and they carry the great weight of the narrative with ease. The rest of the cast are brilliant with, Nathan Fillion, C. Thomas Howell, Cary Elwes, Michael B. Jordan, and Venessa Marshal just to name a few,lend there amazing voices and talent to this action packed and emotionally resonating comic book adventure. It is available now on home video and is a must buy for any DC Universe fan. This entry was posted in cartoons, comic books, Movies, reviews and tagged aquaman, batman, cartoons, cyborg, dc comics, movies, the flash, Wonder Woman. Bookmark the permalink.